Teicoplanin is a frontline glycopeptide antibiotic produced by Actinoplanes teichomyceticus. It is used to treat complicated cases of infection, including pediatric ones, caused by Gram-positive pathogens. There is a steady interest in elucidating the genetic mechanisms determining teicoplanin production, as they would help overproduce known teicoplanins and discover novel glycopeptides. Herein, we investigate the transcriptional organization of the tei biosynthetic gene cluster and the roles of the cluster-situated regulatory genes in controlling teicoplanin production and self-resistance in A. teichomyceticus. We demonstrate that the tei cluster is organized into nine polygenic and nine monogenic transcriptional units. Most of tei biosynthetic genes are subjected to StrR-like Tei15* control, which, in turn, appears to be regulated by LuxR-type Tei16*. Expression of the genes conferring teicoplanin self-resistance in A. teichomyceticus is not co-regulated with antibiotic production. 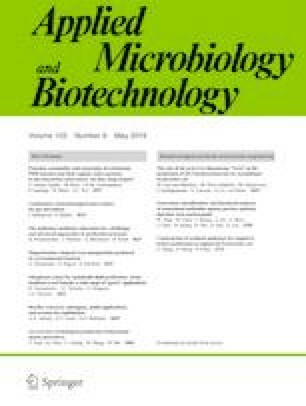 The gene tei31*, coding for a putative DNA binding protein, is not expressed under teicoplanin producing conditions and is dispensable for antibiotic production. Finally, phylogenesis reconstruction of the glycopeptide cluster-encoded regulators reveals two main clades of StrR-like regulators. Tei15* and close orthologues form one of these clades; the second clade is composed by orthologues of Bbr and Dbv4, governing the biosynthesis of balhimycin and teicoplanin-like A40926, respectively. In addition, the LuxR-type Tei16* appears unrelated to the LuxR-like Dbv3, which is controlling A40926 biosynthesis. Our results shed new light on teicoplanin biosynthesis regulation and on the evolution of novel and old glycopeptide biosynthetic gene clusters. The online version of this article ( https://doi.org/10.1007/s00253-019-09789-w) contains supplementary material, which is available to authorized users. This work was supported by grant Bg-46F from the Ministry of Education and Science of Ukraine to V. F., personal grants from CIB (Consorzio Interuniversitario per le Biotecnologie) and DAAD (German Academic Exchange Service) 57048249 to O.Y., and support from the DFG (SFB 766) to E.S.